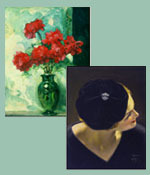 Note Cards: Le Beret & Floral Bouquet 24 cards SALE! Follow this link to find reproductions of several of Agemian's most beloved paintings. These art copies are available in a 10" by 13" size that is suitable for framing and are available in our online shop.